What's Mummy Up To ...: When you've got no hair, you really need a hat! So Bethany, when she was born, had a massive shock of thick black hair, which stuck straight up in the air and couldn't be tamed, but at least it kept her head warm! It didn't fall out, or thin out. It just eventually grew to what is now a much more acceptable hair-style. As a baby, headbands just looked a bit silly, 'cause her hair would stick out either side of the headband. Hannah, on the other hand has been a very different story so far. She was born with a fair bit of hair, but it quickly fell out and now she is bald!! I see this as a super fun chance to play with cute head-gear that I couldn't play with last time round. 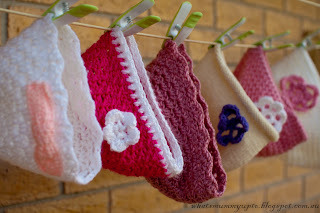 As Hannah was born in summer, I started with some headbands. I was initially planning on just buying some gorgeous headbands I found on ebay that someone else had made. But, having just dropped to 1 income these kind of purchases really didn't seem to be the top of the priority list, so I decided I'd chance an internet search to see if anyone in the world had ever made crochet headbands ... ha ha ha ... there are like a million sites and patterns out there, and lots and lots of free ones ... here's a bunch of headbands I've made! Oh, and Bethany looks great in headbands now too, so she's had her fair share of them as well! In fact, they are so quick and easy, I often just whip them up to match an outfit the night before a special occasion or party. 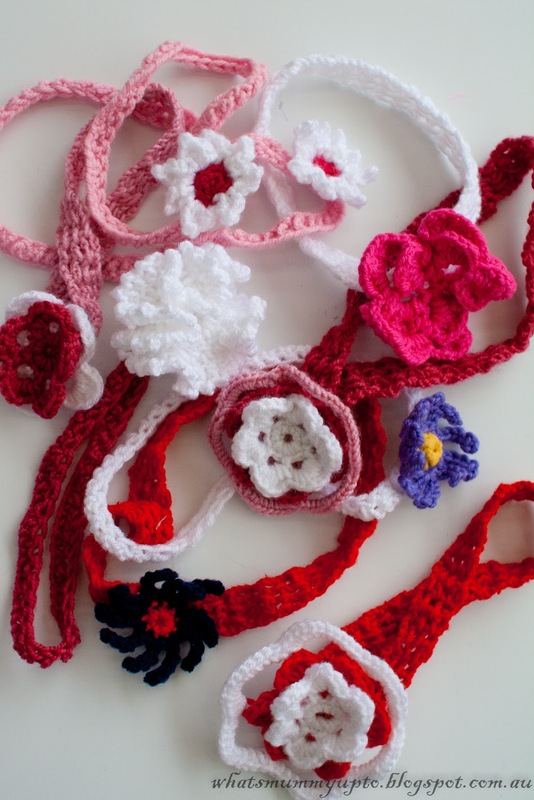 I started by using this pattern, then played with different flower designs which I either found by googling "free crochet flower patterns" or by simply making them up (once you've done a few flowers it's not hard to do). 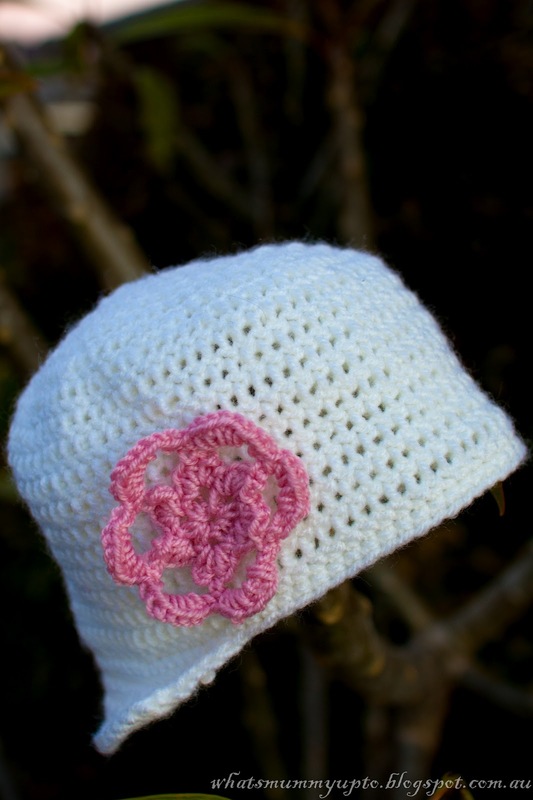 These hats are actually the same pattern, but look quite different as I only used 8 ply for the pink one, but a thicker (12 ply I think) for the white one. These were my first hat attempts ... The pink one is smaller (for Hannah) and the white one (which actually came out better) is Bethany's. I can't tell you how many comments and compliments we've had from people when the girls are out and about in these hats...it really is a gorgeous pattern. Here's where to find it! 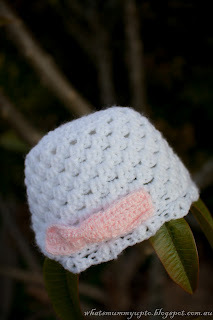 This is the next hat I made...for Hannah this time. I was feeling brave enough to try a trickier stitch, and it was well worth it. It's one of my favourites. I got the pattern here, and just added a flower to jazz it up a little. Also, I don't love pom-poms so decided to leave it off! I've been a fan of the granny-stitch from the very first time I crocheted my first article of clothing...a poncho for Bethany 2 winters ago. 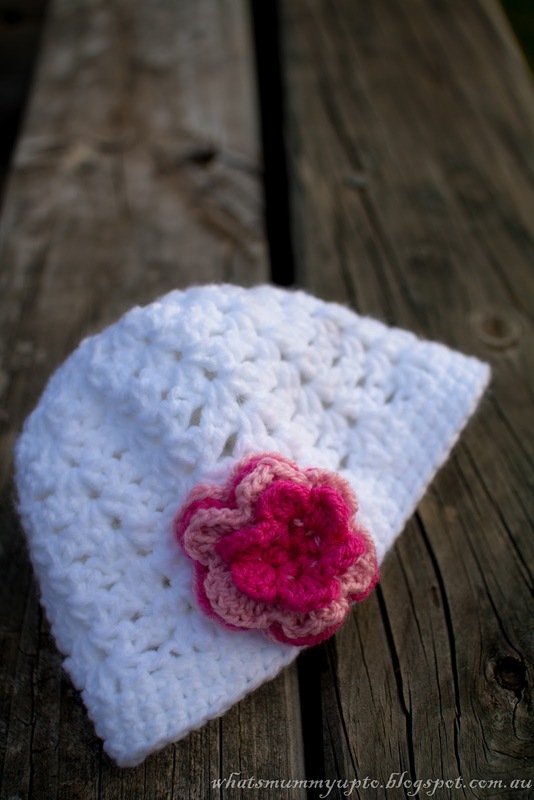 When I found a pattern for a hat using granny-stitch, I couldn't resist. This time Hannah got a white one with a little bow on it using some leftover yarn from a gorgeous cardigan my mum knitted for her. Yay for a matching hat! 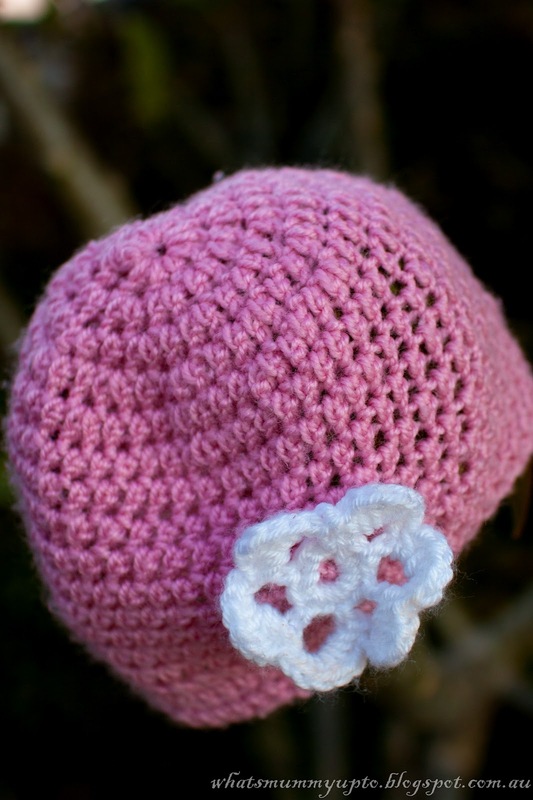 Bethany got a pink one from this pattern, as she was very jealous that Hannah was getting all the pink hats, so I promised she could have a pink one too. Here's the pattern for this one. I found that with the yarn I used and my gauge, I actually added quite a few extra rows to get the hat long enough. In fact Bethany's could have done with a couple more rows I think. If I'm motivated one day, I'll undo the shell edge and add the rows in! ... And that's a big "IF", 'cause knowing me I'll just find a different hat pattern I want to try instead! Now this one only just made it into the blog ... I made it just a couple of days ago. I've been wanting to try a more lace-like look, and love the layered flowers too, which I've never tried before. I'm really happy with how this one for Hannah turned out. It's a 10 ply pattern, but I only had 12 ply on hand, so just went with that. 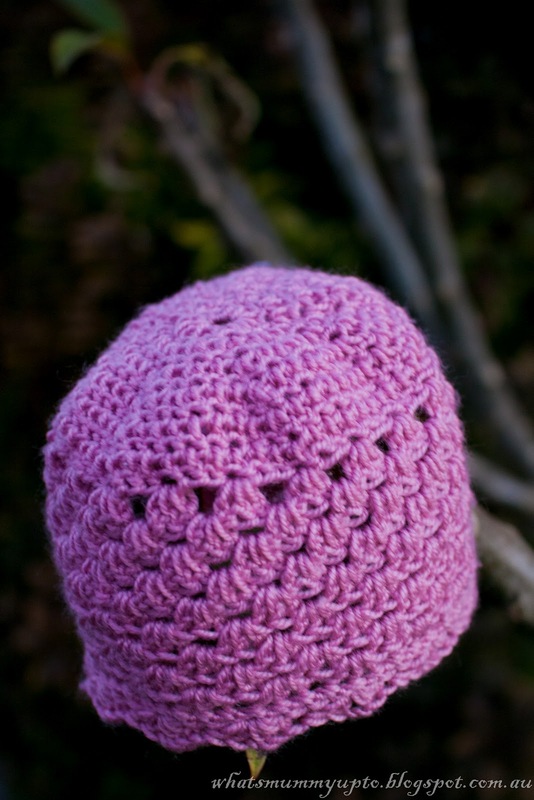 With the thicker yarn, it's a bit warmer, and it's fantastic that there are a good variety of sizes in the pattern... big sister has already put in an order for one ... this time she wants purple, with a "purple and pink flower"! Once again, I added a few extra rows to make it longer, and I think Hannah may even get next year out of it too, 'cause it's a great size. I also loved how the flower was going after completing 2 layers, so I added a 3rd and 4th. Oh, to stop the flower layers from scrunching up and looking messy, I sewed them together from the back, through all the layers before sewing it to the hat. Really makes a difference to how the flower sits. Cute! Here's where I found this one! 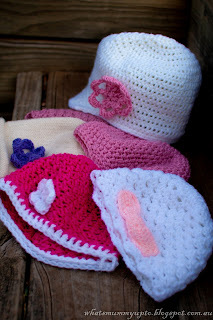 I just love hats on little girls (or boys). The best part of making hats is that they're really quick, and cheap....not even half a ball of yarn usually, and only a 1-evening job...my favourite kind of craft. Oh, and if you're super observant and noticed that I haven't mentioned the cream-coloured hat with the purple flower, that's 'cause it's not one of mine. My Mum knitted this woollen hat for Bethany when she was a baby. I love it's shape...a cute little pixie / gum-nut shape. Unfortunately while it was in storage between munchkins, a moth got to it and made a hole...how rude!! I was so sad, until I realised the hole is exactly in the right spot for a little flower. So I sewed together the hole, found some purple wool and made a flower then covered up that hole. No-one would ever know! Hmmmm ... what to blog about next? ... it sure is getting addictive. Thanks to all those who have read my waffle so far!! 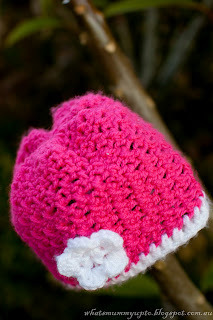 Oh, and if anyone knows of any other cute hat patterns you've had success with, I'd love to know about them! I love the hats. Maybe try a grown ups hat next. They all look so pretty! but I think an update is needed with a much loved dinosaur hat for the boys :) Mr 4 loves the hat you made and wants to wear it everywhere. I think it is even going to school for news as this week is letter 'H'.